(Neven Acropolis with Kevin McKinney and Joe Romm provide an excellent post on this topic in Climate Progress. This post is a brief summary of the associated risks highlighted in their post). Since the earliest humans were walking the earth, the Arctic sea-ice existed in a fairly stable pattern of freezing and melting. 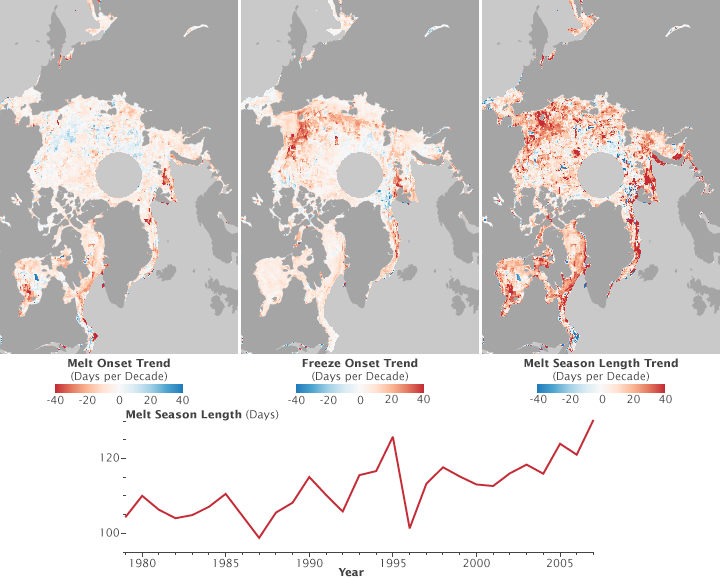 Over the last several decades, those melting and freezing patterns have rapidly shifted. This week, the extent of sea-ice melt reached an all time record minimum, and there is still a month of continued melting ahead. Several studies suggest that the Arctic could be seasonally sea-ice free by 2040, for the first time in human history. In short, this is very serious and disturbing news. The extent of the risk is not entirely known as it is not entirely clear how this extreme melting will affect climate systems and weather patterns. We know that the ice-albedo feedback mechanism is scary. We know that it will have implications for permafrost and the seabed – releasing methane (an extreme climate forcer) into the atmosphere. We know that it will likely disrupt the jet stream causing more of the extreme winters and heatwaves experienced in the US and the rainy summer of England, but we don’t know how much the melting will impact these weather conditions. We know that the melting of the ice can contribute to sea-level rise, inundating coastal communities, but we don’t exactly know how much the waters will rise and when. We also know that it will disrupt the habitats for breeding and hunting grounds of the animals in the arctic, but we don’t know to what extent. In addition to the above, the melting sea ice opens up the potential for new geopolitical tensions between countries vying for access to oil under the sea, new pathways for transportation and fishing grounds. For most of history, these channels and opportunities did not exist, and aside from the Arctic Council and the UN Law of the Sea Convention, there is little in the way of governance to monitor and control for the how countries access the opening. In this instance – a rapidly-melting Arctic – the risks of the unknowns may far outweigh the knowns, and thus deserve an extraordinary amount of attention. Unfortunately, it does not look like these risks will receive the attention they deserve, or that this pattern will reverse anytime soon. So, hold on. The ride through these uncharted waters is likely to be a choppy one. By Francesco Femia & Caitlin Werrell in climate and security on August 26, 2012 .